Welcome our newest sharing feature, the Beauty Album! 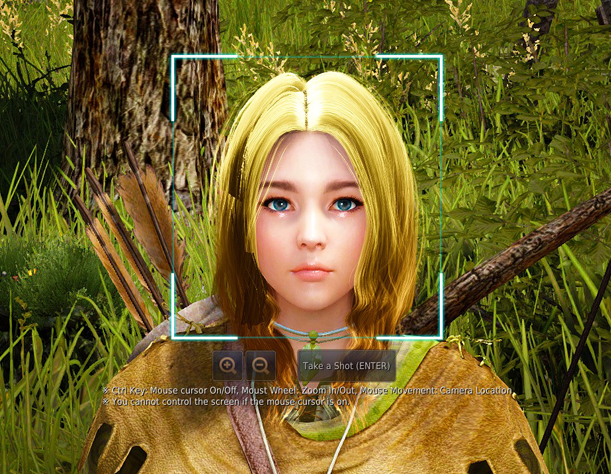 Through the Beauty Album, you can save, manage, and share your character customizations. You can take a snapshot of your character directly and organize the screenshots in albums (folders), If you want, you can also register it to the gallery and share it with other explorers, which means you can download and apply customizations created by other explorers! ★ STEP 01. Copy Your Character to the Album! Press ESC in the game to find the "Beauty Album" menu. Click the icon to open a large window which shows your own folder where you can save your character's current appearance. Now, look at the top right corner of the screen and you will find the "Save Current Appearance" button. Click this button to switch to the camera mode. You can get your character within the focus and take a picture. Use the keyboard's arrow keys to move the screen itself, and press Ctrl to activate the mouse cursor to drag and move the focus to wherever you would like. If you managed to place your character in a nice scene, push Enter to take a picture. The pictures you take will be uploaded to your album directly. Just put in the title and some descriptions when you save them. You can upload pictures to different categories depending on the theme. You can also take these screenshots from the customization screen. 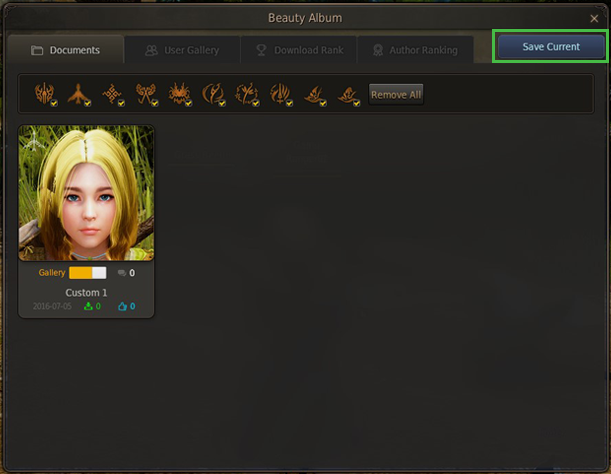 The procedure is the same, and you don't need to connect to the game to use the Beauty Album. ★ STEP 02. Register Your Character to the Gallery! The pictures you took can be registered in the gallery for the whole world to see. Everyone can see your picture once you register it to the gallery, but you can also choose which pictures you want to register in a folder, so there’s no need to worry. You can choose to register to the gallery when you save your picture, and you can also choose to post some pictures from the folder view. You have the power to choose when and what you want to show the world. Your gallery, your way. ★ STEP 03. Apply the Customization Files from the Gallery to Your Character! The best thing about the Beauty Album is that you can apply someone else’s customization work to your character directly from the album. You don't need to go through the rigorous procedure of downloading and moving the file to the right folder. 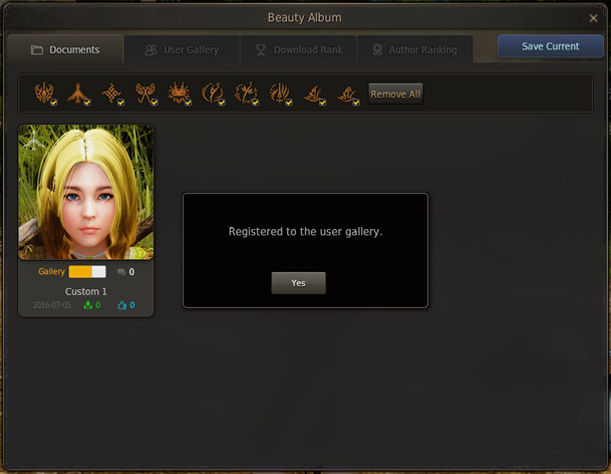 You can browse the pictures uploaded by other explorers on the Gallery tab in the Beauty Album. If you find a work you like that is suitable for your character's class, bring the cursor over the picture and click the "Apply" button to register that work to your customization library. Please remember that you can only apply customizations either through the customization screen or Beauty Shop (F4 key) screen! If somebody applies your customization file to his or her character, your work will gain a download count. Works with the most download counts will be featured in the "Download Ranking" tab. Is there any way to make a character's appearance non-downloadable? Not sharing my character with anyone, it's bad enough seeing celebrity clones and whatnot running around, it's a sea of un-originality already. doesnt work for me. after taking a picture and hitten the save button, it just says that i havent saved yet and wants me to confirm to discard the text. You need to scroll down to see the save button. Caught me out at first as well. I think it's great people want to share, but I don't. Count me out! But it is nice idea for an event. I think many will enjoy this feature. Wish sharing it was optional. This is an awesome feature for many, but there's also a lot of people who put a lot of time into their characters and would like to remain original. I might partake in this event. will there be a title attached to people with the top votes? retarded that you can't just display your character and instead have to have your clones running around. No thanks. Wonder if it would now be possible to choose one of your own portraits to use in the character swap menu rather than the default class pictures. Well i guess i'll just ignore it. Great option for the others tho. Not using this feature, I'd like my characters to stay unique. What would happen if I make the template on a different server? Can I still use the template and upload it on my correct server? Yeah it's a nice feature for sure. Thanks for this. I'd really like an option to share the look of my characters for people to vote on while also preventing others from being able to download them. I'd like to preserve the originality of my characters. While this seems like a fun idea. The actual sharing of the templates is just promoting clones. I want to be able to share my character, because I put a lot of work into it, but for that very same reason I don't want people to be able to download the customization file. There should be an option to only share the image. A lot of us worked really hard on our characters and want to be able to show what we made without having other people able to just press a button and instantly clone our characters without having to put in any effort or creativity of their own. This!! Hopefully PA listens. I've seen many players in the fórums (including me) thinking this way. nobody want your typic templates and if are not typic are like the 99% of players who just cutomized from game or from the 1% that really create a nice template and shared with us normal players that thankfully had customized. So don't make me laugh more please , mine character is the sexiest and still remains for me even if you clone it because i share it. Call me a cynic, but it's promoting appearance change tickets. You don't even see the faces of other players unless you stop and try to... really hard. This is for people who want their character to look a certain way since they do spend so much time looking at them. It's fine, and a neat idea. My ranger's template belongs to me and me alone. Don't know if anyone else had this issue but, i'm playing in 4k mode and not sure if its causing me issues cause it does it in 1080 too with 3 screens. I follow instructions exactly as it say, but instead when i go to take a pic with Enter it puts my screen into Alt+U mode then will Lock up all controls. It won't complete the photo taking process instead locks up all keyboard controls and I can only change camera angles with the mouse. THEN.... it chages how my Screen setup arrangements are so i have to Shut game down and rearrange my monitor setups aswell as Display settings. Never have I had a Game give so many broken Patches. So until then No photo sharing from my 2 hour char creations.